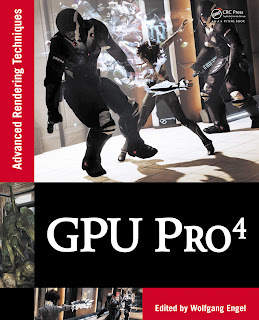 After the success of the first seven entries to the ShaderX book series, of GPU Pro (gpupro.blogspot.com), GPU Pro 2 (gpupro2.blogspot.com) and the soon to be released GPU Pro 3 (gpupro3.blogspot.com), we are looking for authors for GPU Pro 4. The upcoming book will cover advanced rendering techniques that run on the DirectX or OpenGL run-times, or any other run-time with any language available. It will include topics on: Geometry Manipulation; Rendering Techniques; Handheld Devices Programming; Effects in Image Space; Shadows; 3D Engine Design; Graphics Related Tools; Environmental Effects and a dedicated section on General Purpose GPU Programming that will cover CUDA, DirectCompute and OpenCL examples. This time, we want to emphasize the new compute APIs and browser-based rendering techniques. Proposals are due by March 17th, 2012. Please send them to wolf at shaderx.com. An example proposal, writing guidelines and a FAQ can be downloaded from below. March 17th, 2012 Proposals due ! Please download the author guidelines with examples for proposals and the tex example files from here. This download is about 2.9 MB.